With 2010’s animated adventure Megamind, we view the world of the superhero from the villain’s point of view. As seen in flashback, an alien infant gets sent to Earth as his home planet explodes – and he finds himself superceded by another baby jettisoned from a different dying world. The latter child grows up in the lap of luxury, while the former gets stuck with prison inmates. Thus both go down different paths, as one baby grows up to be Metro Man (voiced by Brad Pitt), the virtuous super-protector of Metro City. As for the other one, he takes the villainous route: a blue dude with an enormous cranium, Megamind (Will Ferrell) fashions himself as Metro Man’s archenemy. Megamind and Metro Man battle for years – with our blue friend inevitably on the losing end – until one day Megamind actually manages to kill his rival. Exultant at first, Megamind gradually becomes bored without his foe to battle, so he decides to create a new superhero named Titan (Jonah Hill) – or “Tighten”, as the dim-witted dude calls himself. Megamind’s efforts go awry, however, as Tighten instead turns into a super-villain. This leads Megamind to tread a new path, as he now fashions himself as the hero who will stop Tighten – and win the heart of spunky reporter Roxanne Ritchi (Tina Fey) as well. Ever since DreamWorks Animation released their first movies in 1998, I’ve found the studio to produce competent but generally uninspired work. Oh, I’ve enjoyed a lot of their flicks, but these films never approached the heights enjoyed by Pixar. DreamWorks’ efforts delivered decent entertainment but they lacked the warmth, heart and ingenuity of the better Pixar tales. I won’t claim that Megamind equals Pixar’s peaks, as it doesn’t come with the depth and emotionality one expects from DreamWorks’ competitor. That said, Megamind delivers much better than usual entertainment for DreamWorks Animation and it becomes a consistently fun experience. Much of the charm comes from the actors. Ferrell tones down some of his goofy excesses to offer a terrific performance as Megamind. While he delivers the comedy we need, he also gives his character a good sense of heart and depth. Fey gets the more underwritten part as Roxanne, but she adds spark to the role as well, and Pitt has fun with the campy aspects of his straight man character. All involved contribute a lot of fun to their work. Megamind also delivers a clever twist on the superhero genre. Of course, it mostly riffs off the Superman legend, but it sneaks in references to other works as well, and it makes these allusions lively and endearing. Like I said, Megamind doesn’t dig deep like the better Pixar films, so don’t expect it to stick with you in the same way. Nonetheless, it brings us a fun comedic adventure that stands as one of the stronger DreamWorks releases. Footnote: stick around through the middle of the end credits to see a little tag scene. Megamind appears in an aspect ratio of approximately 2.35:1 on this Blu-ray Disc. Though not the best I’ve seen, the visuals seemed more than satisfactory. Sharpness appeared strong. A few tiny slivers of softness hit a few super-wide shots, but those were negligible. The vast majority of the film presented excellent delineation. The side of a skyscraper showed a little shimmering, but I saw no signs of jaggies or edge enhancement. This transfer lacked any form of distracting defects. With its stylized comic book look, Megamind presented a broad palette, and the disc replicated those hues well. It veered from bright, warm tones to quieter, more subdued colors with ease and made all of them look vivid and distinctive. Blacks were deep and dense, and the shadows seemed smooth and accurately rendered. Overall, the image looked pretty terrific. Megamind offered a strong soundtrack, as the DTS-HD MA 7.1 mix boasted lively material. With all the superhero action, the movie had many chances to make great use of the various channels, and it lived up to those expectations. At all times, the movie created a good sense of environment and utilized the different speakers to its advantage. Elements were well-placed and blended smoothly. Music also presented nice stereo imaging. Of course, the action sequences were the most memorable. From start to finish, those helped place us in the world of the super characters, as the battles and destruction came from all around us. These moments came across as winning and involving, and they helped make the mix very involving. Audio quality kept up with the high standards of the rest of the package. Speech always sounded natural and warm, with no edginess or intelligibility issues. The score was bright and vivid, as the track punched the music well. Effects finished things with accurate, dynamic audio that represented the elements in a lively manner. Bass response remained consistently deep and firm, as the low-end added solid punch to the track. The audio merited a straight “A”. The package includes both 2D and 3D versions of Aliens. The picture comments above reflected the 2D edition – how did the 3D compare? Visuals seemed virtually identical, as the 3D movie continued to look great. It showed nary a dip in terms of sharpness, colors or darkness. In terms of stereo imaging, Megamind worked well. It it came with a bunch of fun “pop out” moments, and the image boasted a fine sense of depth as well. All of this added up to a 3D presentation that impressed. Outside of a 3D trailer for Puss in Boots, no extras appear on the Blu-ray itself. An included DVD copy brings some bonus materials, though, and we open with an audio commentary from director Tom McGrath, producers Lara Breay and Denise Nolan Cascino and writers Alan Schoolcraft and Brent Simons. 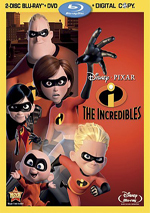 All five sit together for this running, screen-specific take on the film’s origins and development, story/character areas, cast and performances, animation, music, 3D and related topics. With this commentary, we get a solid overview of the production. The track covers a good array of subjects and does so in an earnest manner. I’ve found a lot of DreamWorks Animation commentaries to be too “jokey”, so I’m glad this one takes matters more seriously. One deleted scene runs one minute, 36 seconds. Introduced by Breay, we see more of Megamind’s post-Metro Man depression. It offers minor entertainment. A featurette called Meet the Cast runs nine minutes, 26 seconds and includes comments from Cascino, McGrath, Breay, and actors Will Ferrell, David Cross and Jonah Hill. As expected, the clip looks at cast, characters and performances. It lacks real depth but it gives us some fun notes. Inside Megamind’s Lair goes for seven minutes, 17 seconds and features McGrath, Breay, Cascino, Lamb and James. We learn of character, prop and set design. This becomes a decent little summary. Under The World of DreamWorks Animation, we find various promotional elements related to Shrek, Madagascar, How to Train Your Dragon and Kung Fu Panda. Mostly we get music videos, but a few trailers appear as well. Previews adds promos for Kung Fu Panda 2, Rango and the Megamind game. 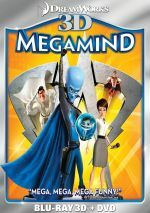 A delightful twist on the superhero genre, Megamind gives us a story from the villain’s point of view. It offers a nice mix of comedy and humor, all executed by a strong cast. 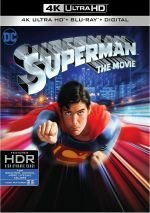 The Blu-ray boasts excellent picture and audio along with a handful of supplements. Megamind winds up as one of the better DreamWorks Animation efforts, and the 3D version adds fun to the proceedings.